Instant Pot Ribs, Fall Off the Bone TENDER in Less Than 1hr! Because they’re the most fall-off-the-bone, tender and juicy, delectably delicious ribs you’ll ever take a bite of — and they’ll be ready to eat in a FRACTION of the time! Instant pot ribs have officially be added to the easy low carb dinners list, thanks to the instant pot! Ribs have always been one of my favorite low carb dinners — but (pre-instant pot), I hated how long they took to make, so I only made them for special occasions. Now that I make instant pot ribs, I cook them alllllllll the time! I’m telling you — if you’re on the fence about buying another kitchen appliance, these instant pot ribs are about to become the only inspiration you need! 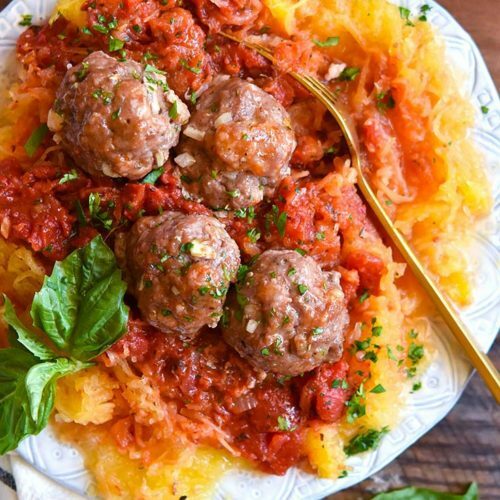 As with all low carb recipes, your meal will only be as good as the ingredients you use. I’ve purchased bad ribs multiple times, and no instant pot cooking or perfect technique will make them as delicious as they’d be otherwise! Go somewhere trustworthy, our favorite instant pot ribs are from Costco. For suuuper tender ribs, it’s important to remove the membrane! In fact, no matter how long you cook your instant pot ribs, if the membrane is still on, the ribs won’t be tender. Before getting started, make sure your ribs actually have a membrane, as some butchers will remove it for you (confession: the first time I made instant pot ribs, I didn’t know that and spent FOREVER trying to remove something that wasn’t there!). To remove the membrane place the ribs bone side up, and slide a butter knife between two ribs. Grab the edge of the membrane with a paper towel and pull — it should easily peel off the entire backside of your ribs. It’s easier with practice, trust me! 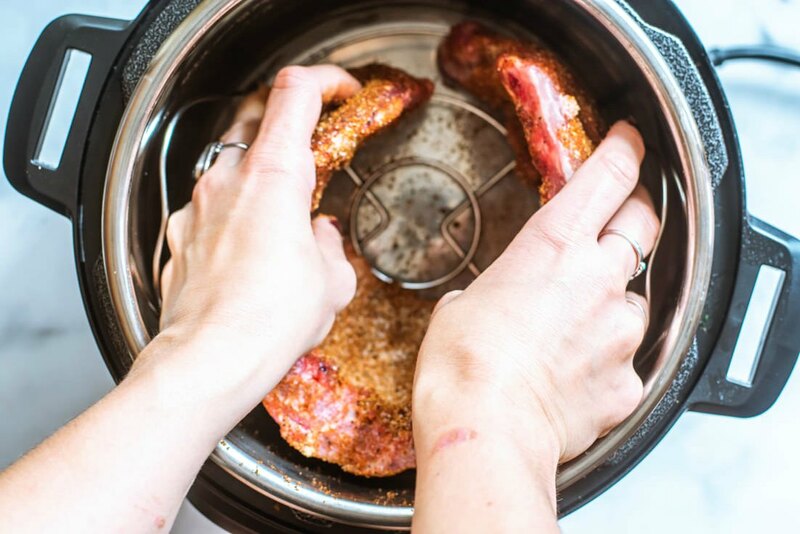 Pat dry your instant pot ribs with paper towels — this will ensure your tasty rub sticks to the surface. A rub is the best way to season instant pot ribs, as cooking them in the instant pot essentially steams them, so any sorts of sauce would slide right off. Use your favorite rib rub on these instant pot ribs (I’ll share my favorite in the recipe below). Sprinkle the rub over your instant pot ribs, then pat it into the surface. 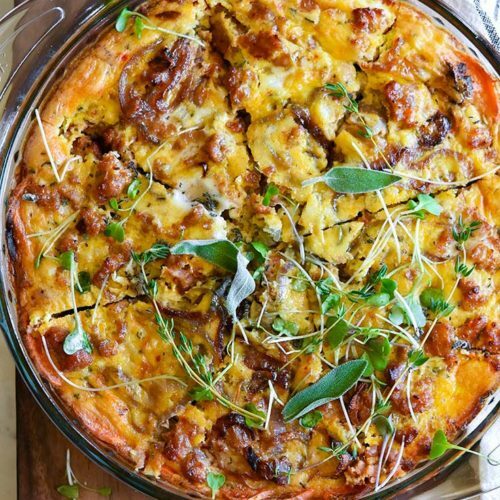 Place one cup of water into your instant pot, and prepare the trivet inside. If this is one of you first times using the instant pot, here’s the rundown on the trivet (I was super confused at first). The trivet is that metal frame that comes with the instant pot. 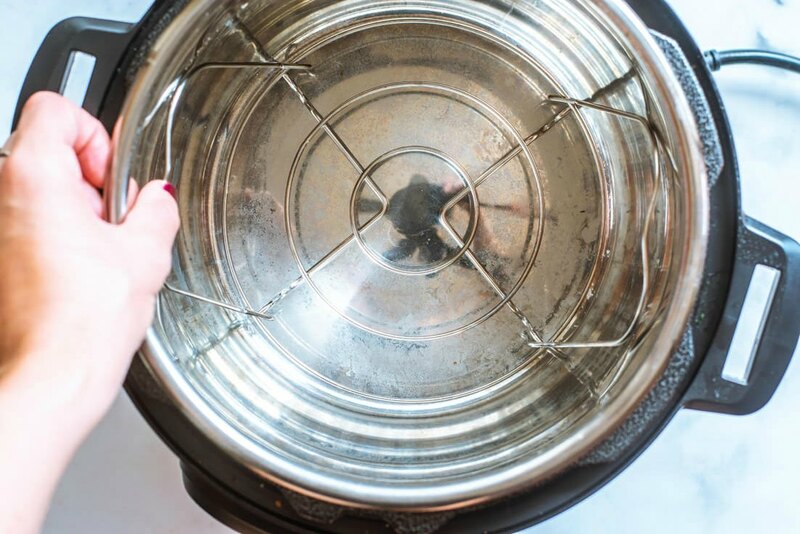 You want the feet of the trivet on the bottom and the arms to go up along the sides — this makes it easier to pull the instant pot ribs out, while preventing any burning on the bottom. We’ll then coil our instant pot ribs, one inside of the other, standing up in the instant pot. 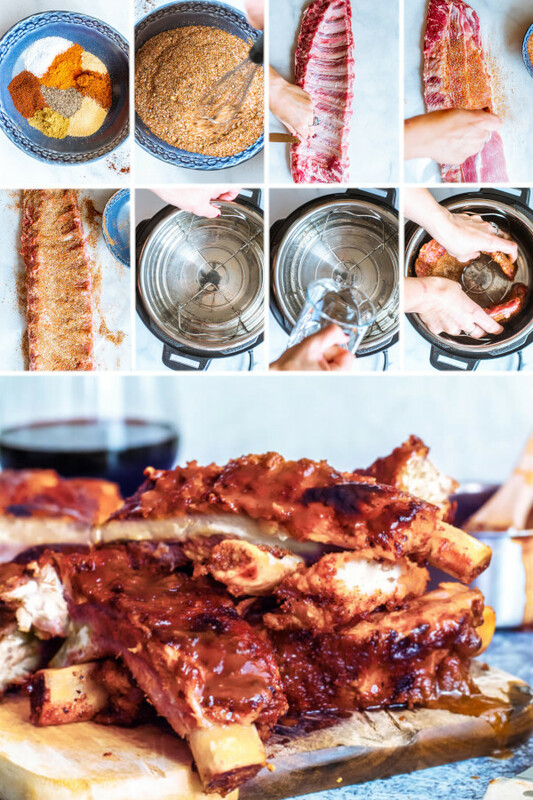 Check out the instant pot ribs photos in this article for reference, I know this part sounds confusing but it’s easy! I cooked these in my Duo60 Instant Pot which is 6qt, if you’d like to make 3 qt instant pot ribs, use half the ribs. First the pressure cooker will need to come to temperature, this should take about 15 minutes. Then the 20 minute cook time will start. And last but not least, we’ll need to quick release the pressure, which took me about 10 minutes. How do you know when your instant pot ribs are done? You’ll know your ribs are done when they bend gently. When I pull these instant pot ribs out, usually a few are so tender they literally fall off the bone. I recommend using tongs and allowing them to cool for a minute or two before trying to pull them out. 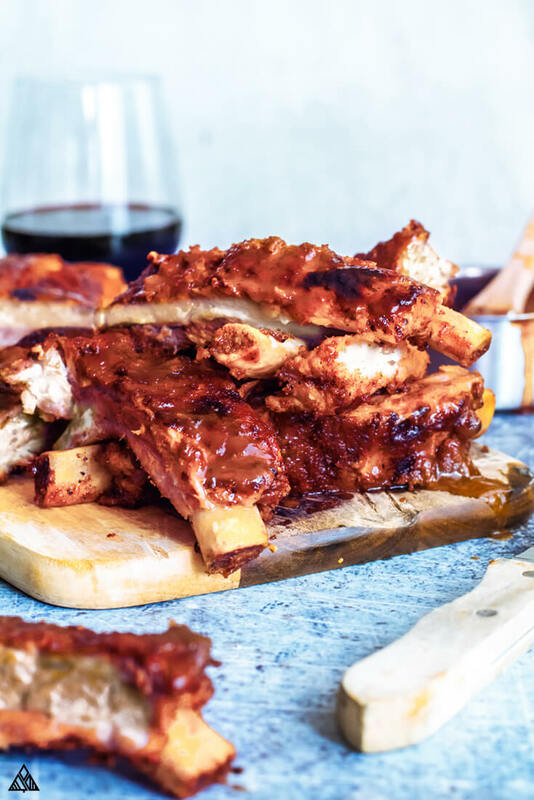 Broiling instant pot ribs after they’ve been coated in your favorite BBQ sauce is the secret to perfectly caramelized and super delicious ribs! 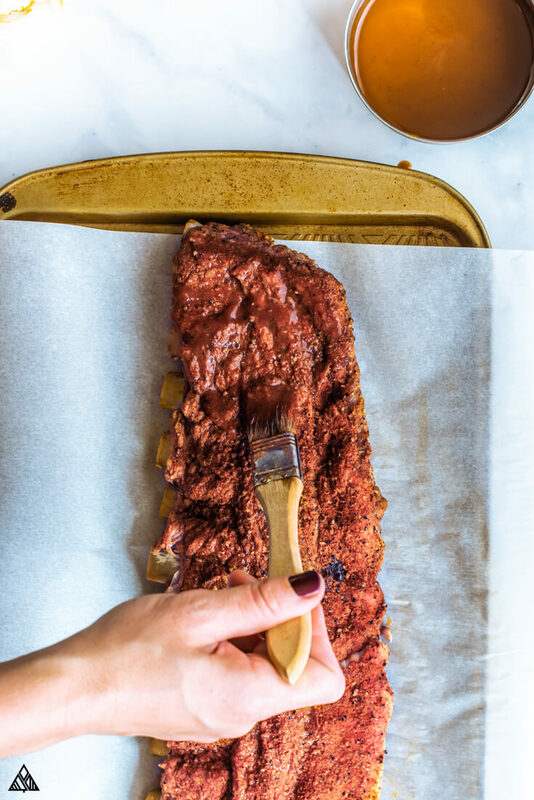 Using a brush, coat your instant pot ribs in your favorite BBQ sauce, then place them flat on a baking sheet and into the oven until the barbecue sauce caramelizes. Check your instant pot ribs often — at this temperature they’re easy to burn! Alternatively, you can make instant pot ribs finish on grill using the same technique as above — the grill or oven are only needed to achieve that crispy edge. Reheating instant pot pork ribs is so easy! Simply place the instant pot ribs flat on a baking sheet and into the oven at 350 F. Once the ribs reach your desired temp, pull them out and crank the oven up to broil. 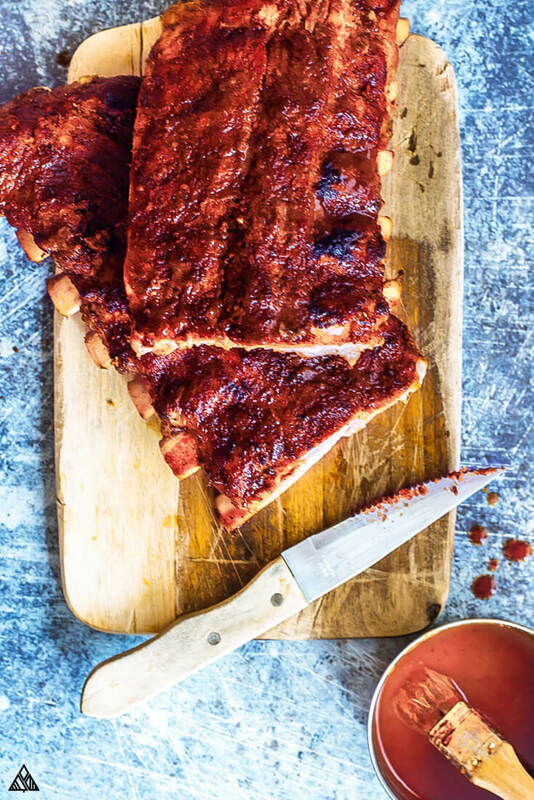 Coat your instant pot ribs with a fresh layer of BBQ sauce and allow them to broil until the edges caramelize. Low carb meal prep tip: Since this recipe makes such a large serving, I’ll often make the instant pot ribs in bulk, and broil only as many ribs as we’ll eat that evening. The rest of the ribs are stored in the fridge, and are super easy to reheat (per the suggestions above) for quick low carb meals! I used my family’s favorite spice rub for these instant pot ribs, which is a super simple combo of cumin, garlic powder, paprika, and (VERY important) smoked salt. 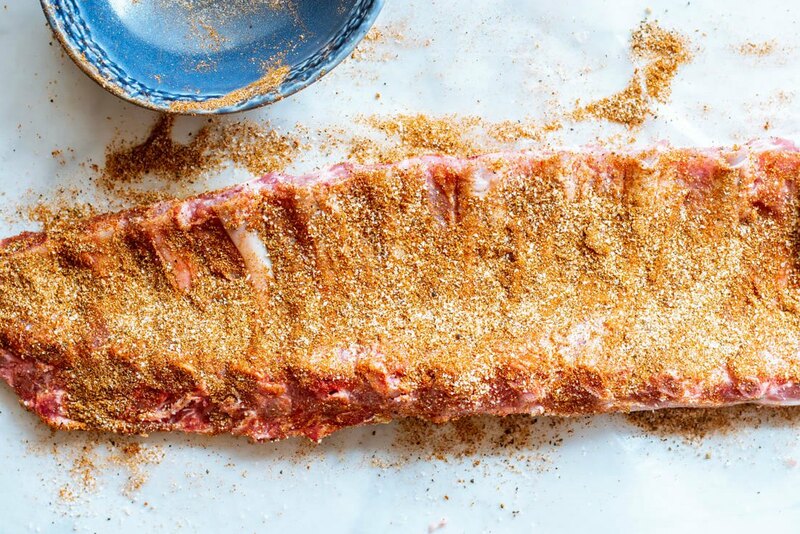 The reason smoked salt is so important in the rub for these instant pot ribs, is we aren’t smoking or BBQ-ing them, so the salt helps add a bit of that flavor back to the instant pot ribs. Trust me on this one guys! If you’d prefer, swap the rub below with your family’s favorite! Since I stick to low carb foods, I opted for low carb barbecue sauce on my ribs. Use your favorite BBQ sauce — or try two sauces, as this recipe makes 2 racks of ribs. Potato salad or cauliflower potato salad, instant pot ribs and potatoes are always a crowd pleaser! I can’t wait to hear what you think about this instant pot ribs recipe! I hope you find them is juicy tender and addictingly delicious as we do. Let me know your thoughts in the comments below and enjoy! 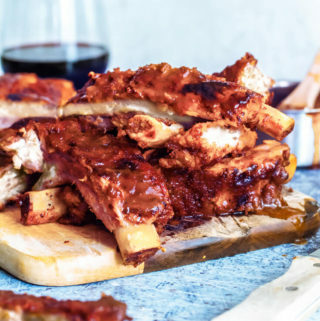 Once you try this SUUUPER tender instant pot ribs recipe, you’ll never eat ribs any other way! Pork country style, fall off the bone ribs in less than an hour, BEST dinner ever! 2 Tablespoons Brown Sugar packed. I used granular erythritol. In a small bowl, combine your spice rub ingredients. 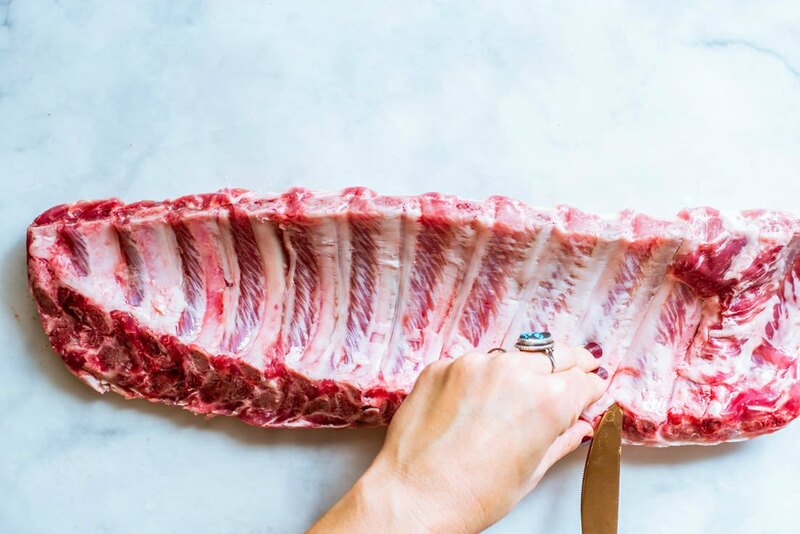 Remove your ribs from their packaging and place them bone side up on a cutting board. Use a butter knife to carefully remove the membrane. This can be done by inserting the knife between 2 ribs and grabbing hold of the membrane with a paper towel. Then remove the membrane from the back of the ribs (check out the video above for a visual!). Pat dry the ribs with paper towels. Season your ribs, then press it into the surface of the ribs. Place the trivet inside your instant pot (I used a 6 qt instant pot to fit all these ribs). Place the ribs inside by coiling them around the sides of the instant pot, and standing them upright. One rack of ribs should fit inside the other. Secure the lid on top, and make sure the quick release is set to “sealing”. Press “pressure cooker” and set the cook time to 20 minutes. Make sure “high pressure” is selected. It’ll take your instant about 15 minutes to come to pressure. Once the ribs have cooked for 20 minutes (your pressure cooker will beep), twist the quick release to “venting”. Meanwhile, turn your oven on broil. Once vented (this took me about 8 minutes), remove the ribs from the instant pot using tongs, and place them on a baking sheet. Brush your ribs with BBQ sauce. Broil them in the oven for about 3-5 minutes, or until the edges become caramelized. Remove your ribs from oven, and place them on a cutting board. Cut in between each rib. 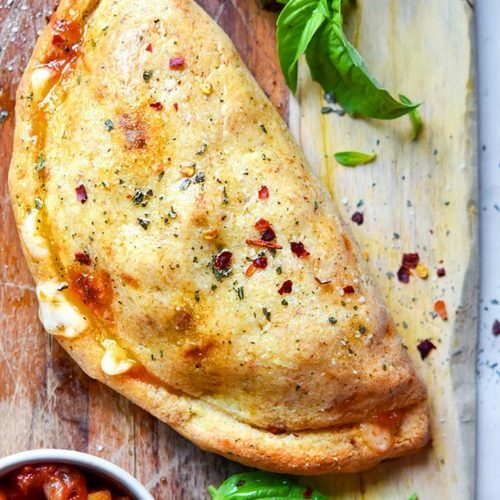 Serve with more BBQ sauce and enjoy! The nutritional information below was calculated using my low carb BBQ sauce recipe. « Easy Keto Chia Pudding, 3 Suuuper Tasty Variations!